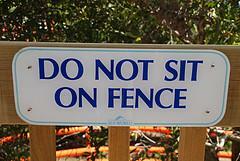 Why are you still fence sitting? You want to vote Republican to help the economy, right? However, you are worried about the environment, women’s needs and education right? Republicans are concerned about the environment, women’s needs and education.Please see the resumes of Dan Matthews, candidate for US Congress and John Swapp, candidate for Washington Senate.Both are advocates for the environment as well as business friendly legislation.Rob McKenna, candidate for Washington Governor has a platform made up of ways to make government and education more efficient. Michael Baumagartner, candidate for US Senate as a previous state senator has bipartisan support for his economic and leadership skills. As a republican woman I find offense with the democrat tactic of fabricating a war on women.Ladies, we are too smart to believe that any party would work to diminish women’s rights today.Democrats have insulted us to have us fall into thinking republicans want to interfere with our personal freedoms.Women are empowered to make choices of their behaviors. Women have access to any health care they want.The catch is whether we get it paid by the government or by ourselves.Notice I didn’t say “free”.Government provided services are paid by you,me and our neighbors.Of course the needs of the underprivileged will always be helped by government.But what constitutes a need? Food stamps,emergency housing…..Really, how did birth control get in there? I alone am responsible for my behavior and its consequences. I answer to God, my husband and my friends.Women empower yourselves. Make good choices in your life and get off the fence.Vote Republican.